Flow Country is part of the Tentative list of UK in order to qualify for inclusion in the World Heritage List. 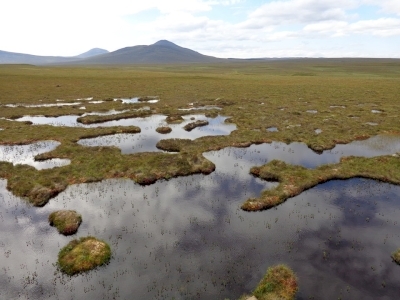 Flow country is the name given to a large area of bog in the very northern part of mainland Scotland. We visited that region during our “tour of Scotland” in summer 2015. We drove to Forsinard, where a small visitors center is housed in the train station, surrounded by few houses. I understood that the train line and station were still in operation at that time (unexpected for such a tiny and remote village), so this could be a travel alternative to car for those willing to visit that place. The visitors center is operated by RSPB (Royal Society for Protection of Birds) and gives helpful information about fauna and flora of the area. Main attraction is the nearby board walkway, leading to the recently built observation tower. The area is wide, quite flat with few “bens” (Scottish mountains) in the background, and extremely quiet and relax (and clearly off beaten tracks). We really enjoyed the landscape, as not comparable to any other in Europe (I remember some bogs in French Massif Central, but there is no way they can compete in terms of extend and landscape), as well as observation of insects, lizards and droseras around the small pools. All activities were free of charge. I would be happy to see this area inscribed one day, and I recommend this place to anyone visiting this area (and by the way, the road to Durness, that we drove on the next day, goes along what is probably one of the most scenic coasts of all the UK). I remember also seeing several signs along the road, not really in favor of the protection of nature in that region. Back home, I found out on Internet that in the 1980s the area had been subject to changes to boost activity, such as planting trees and drainage of the land to develop farming, until it was stopped in the 1990s under consideration of the uniqueness of this natural heritage (with RSPB leading the fight for protection). Antagonism between development of human activities and heritage preservation is not something new, but I believe that full support of people living in the area is a must before inscription of any site as a WHS. It may still take some time before this candidate site would move forward.